Tired of fighting a losing battle against bathroom grime? We’ve got a few quick tips for keeping your bathroom clean and fresh so you’ll never have to worry about what guests think ever again. The shower nozzle is one of the most neglected pieces of bathroom equipment, but it needs cleaning just like everything else. If you’ve noticed that the flow of water isn’t as strong as it used to be, or can see deposits building up in the holes, there’s a quick and easy way to fix it. Just fill a plastic bag (big enough to submerge the whole showerhead) with white vinegar, and then hang it from the shower head, letting the nozzle soak in the liquid overnight. Plastic grocery bags work best for this task, as you can tie the handles around the neck of the nozzle to keep it in place. Cleaning the toilet is most people’s least favorite household chore, but it’s an absolutely essential step to keeping your bathroom clean. Thankfully, you don’t need to spend a long time kneeling over the bowl scrubbing to get the job done. To give your toilet a good, deep clean, pour a cup of bleach into the bowl, then scrub around the bowl and under the rim with a toilet brush. Let it stand for 5 minutes, then flush to wash all those nasty germs away. 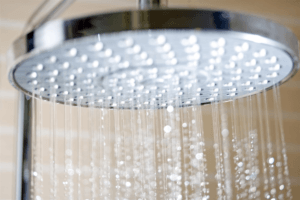 Nothing feels as good as a long, hot shower or bath, but all that steam the warm water creates is helping bacteria and germs thrive in your bathroom. If the idea of bathing in a room full of gross bacteria doesn’t sound like fun to you, be sure to wipe away the condensation from all surfaces after a bath or shower, and to leave the window open for at least one hour afterward. Not a fan of artificial air fresheners? No problem! Creating your own natural, scented air fresheners is much easier than many people believe. One of the easiest to create at home is a natural, lemon-scented spray. Just put 1/8 cup baking soda in 2 cups hot water, mixing until the baking soda has been completely dissolved. 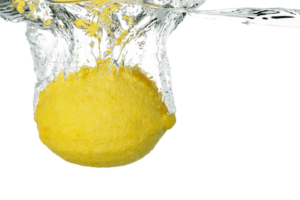 Then, add ½ cup lemon juice, and transfer the mixture over to a spray bottle. Give it a good shake, and you’re ready to start spreading that lovely lemon smell whenever it’s needed. Eucalyptus leaves don’t just smell great – they also add a nice visual flourish that can spruce up even the plainest bathroom design. Place a few dried eucalyptus sprigs in a vase and place them on the counter or on top of your bathroom shelves, and they’ll add a nice, fresh scent to your bathroom all day long. Bathroom drains tend to get clogged with hair and soap particles, which can block the flow of water. Don’t worry, though – you don’t need to call a plumber to take care of it. Clearing bathroom drains is as easy as pouring a small amount of baking soda down the sink, then following it with white vinegar. When the two substances interact, the baking soda expands, pushing all the nastiness built up in the drain along with it. Follow up by running hot water down the sink for a few minutes to make sure everything’s been flushed out. Need more great bathroom maintenance ideas? American Bath Enterprises Inc. specializes in everything bathrooms, including replacement shower stall enclosures and more. Contact us today at 888-228-4925.